The Best Value On The Market! 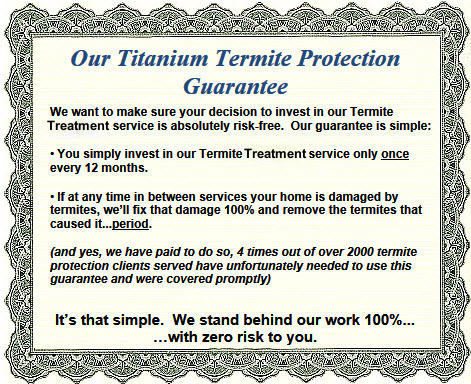 Until April 30, if you invest in our 100% Guaranteed Termite Protection Plan, you will also receive one full year of Home Pest Control service absolutely FREE! Termites are a huge problem, especially in the southeast. Why? Abundant moisture and warm, year around temperatures. This allows termite colonies to thrive. The question is not, if you will get termites, but when. Fact: There are 6-13 termite colonies per acre in Georgia soil. Each colony has on average 1.3 million termites. They are constantly on the lookout for a fresh meal. How Do Termites Get Into My House? Termites will squeeze through cracks as narrow as 1/32 of an inch. These cracks may be virtually undetectable. Examples of such areas include expansion joints, foundation cracks, and plumbing and electrical entry points. We have treated homes with termites found in virtually every place you can envision. What type of termite protection do you offer or recommend? There are many termite treatment options available to protect your home. The two most common and effective options include liquid treatments and baiting systems. Which one is best for your home? Well, that depends on the home’s construction and its conducive conditions. To determine which treatment option is best for your situation, we always provide a free termite inspection. We offer an assessment of your options so you can make a good decision for you. If the liquid treatment option is deemed best, what type do you use? Haynes uses Termidor ®-- America's #1 termite defense. Why? It's the best for a liquid barrier treatment! We have used Termidor for approximately 15 years with complete success. Nationally, Termidor has protected over 4 million homes since 2000. Termidor starts working immediately and rids homes of termites fast. Whenever a termite ingests or even touches Termidor, it can become a "carrier", transferring Termidor to other termites it meets. These termites can become secondary carriers, behaving normally while they transfer Termidor to other termites they contact. Because Termidor is slow-acting, individual termites have ample time to transfer it to others in the population. This unique process is called the "transfer effect." There is essentially no odor, and the application binds tightly to the soil in which it is applied. This maintains a protective treatment zone through rainfall and irrigation. It also minimizes the chance for off-site movement. Only pest professionals, who have been Termidor -certified, may apply Termidor. Termidor has a very flexible label, which allows us to use fewer chemicals in many situations than other termiticides on the market. We pride ourselves on using a smart approach in both our applications for termites and household pest control. More knowledge, less pesticide, better value. For more details on Termidor and the advantages of a liquid termiticide instead of a baiting system, read here. If the baiting option is deemed best, what type do you use? Haynes uses Sentricon ® Termite Colony Elimination System with Always Active.™ The Sentricon System provides continuous protection from termites. With Always Active technology, we put new Recruit® HD termite bait in all Sentricon stations from the beginning so termites can begin feeding on it as soon as they find a station. They then share the bait with other termites, beginning the colony elimination process. The bait remains in all the Sentricon stations all the time, offering constant property protection and peace of mind. The Recruit HD termite bait continues to protect no matter what the soil condition, weather or season. Because the bait is so dense and durable, we will be inspecting and servicing your property annually, minimizing the chance of servicing a station when termites are feeding. In some cases, a termite treatment plan calls for a combination of a liquid treatment and baiting system. We are happy to customize an approach that fits your situation.